The sudden weakness in the Rupee has caught most of us by surprise and has caused Rupee to cross the 45 mark once again agsinst the Singapore Dollar. I was expecting the pair to face stiff resistance at 44 mark and not breach the 44 mark any time soon (Sgd Inr expected trend till end of June 2013). 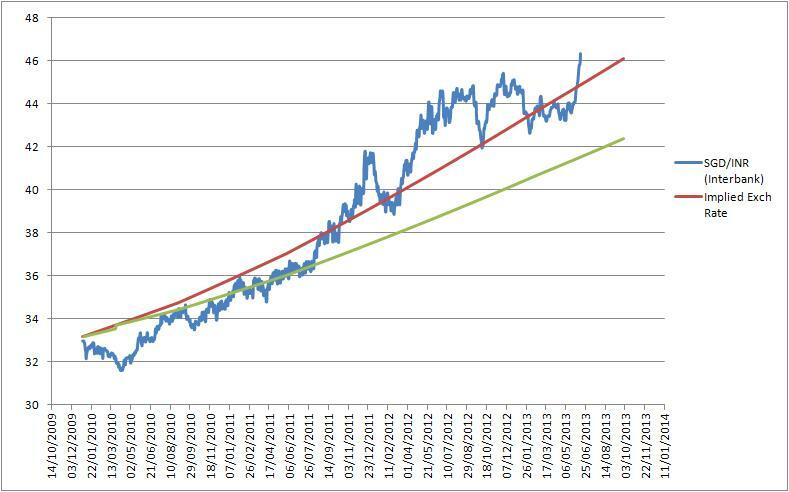 The rationale being that SGD and INR would both move in tandem against the USD which would make SGD INR a stable pair. Indian Rupee (INR) on the other hand weakened against the USD with rising Gold Imports and expanding deficit and is nearing 57 against the USD as I write. Its quite evident from the trend line that everytime SGD INR has crossed the trend line it tends to reverse back to the mean. Every cross over is a good opportunity to convert to INR for investment or other purposes. Market rumours suggest INR would touch the 58 mark against the US dollar which could see SGD INR crossing the 46 mark which for me would be a great level to convert. My suggestion as always is convert in small amounts to average out your conversion rate as its not possible to catch the top and bottom of any market.